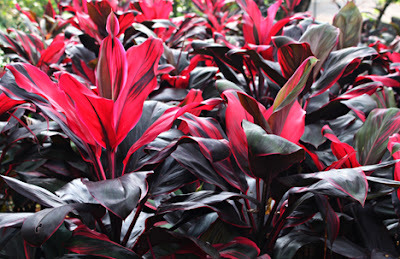 Another Interisting thing about Cordyline fruticosa is the color change to red when exposed to direct sunlight. Ti plant leaves is lanceolate with a with covered with reddish green color. But some certain types also have a leaf color that is so green. A cursory feature can see the attachment of the picture above. What are the chemical compounds of ti plant leaves? There are several natural compounds that can be found in all parts of the plant andong with benefits for our healthy. Some of these substances are starch, flavonoids, polyphenols, iron, saponins, tannins, polysaccharides, calcium oxalate, thymidine, and steroids. We can find all the chemical compounds from the root, flowers, stems and leaves. With all the chemical compounds, Ti plant can used as natural herbal remedies, it can provides us with some benefit like an anti-bacterial, soothing, antioagulant, and antiproliferatif. With all the chemical compounds, Ti plant can used as natural herbal medicine, it can provides us with some benefit like an anti-bacterial, soothing, antioagulant, and antiproliferatif. One of the most common benefits from Cordyline fruticosa is its capability as an anti inflammation or swelling of the gums. You can apply the the ti plant leaf by smoothing the leaves andong, mix with a little salt and apply on the swollen gums. Your gums will quickly heal and minimize the pain. Hemorrhoids usually occur in people who drink less, less of physical activity, and sit too much, and didn’t comsume enough fiber. The disease can be identified by the presence of a mixture of blood stains on the feces (fese) when you defecate. When its get worse, it will be very disturbing because you will have difficulty to sitting, anemia (lack of blood) and many others. To use Ti Plant as for treat Hemorrhoids, you simply combine 7 pieces of purple leaves and 3 sheets of Ti Plant leaves. Wash and crushed both then boiled with 3 cups of water until it remaining 2 cups. Drinking routinely 2 times a day until the hemorrhoids you suffer are completely healed. Sometimes these health problems make the sufferer panicked because of something strange in urine color. This change is identified by urine that mixed with blood and make the urine color becomes reddened and painful when urinating. To overcome this disease, boil 600gr roots and leaves ti plant using 3 cups of water until the remaining about 2 cups. Drink ingredients regularly 2 times a day (morning and night), each 1/2 cup for one time consumption. Every women could experience this problem and it is a very familiar. Ti plant leaves have a unique ability so that your menstrual period can run normally. All you have to do is boil the roots and leaves andong with water and drink regularly. Asthma disease associated with the respiratory system due to a disturbance, it can also caused by genetics factor. Asthma is also called shortness of breath so that people will find it difficult when they want to breath. To overcome it you can consume the decoction of leaves and roots of ti plant plants. Still associated with the respiratory system, severe cough sometimes also carries blood due to infection. To cure it, you can boil the leaves, roots and flowers of Ti Plants that have been dried and drink it regularly as much as 3 times a day. This problem is related to the digestive system and there are symptoms such as mucus feces, repeated diarrhea and many others. To heal, prepare the leaves and roots of ti plant that have dried and then boil until it boiling. Drink 3 times a day on a regular basis until healed. This disease due to uncontrolled stomach acid that causes nausea, lack of appetite, and often stomach pain. But this problem you can overcome by consuming boiled leaf andong regularly. Cordyline fruticosa are believed to inhibit the growth of tumor cells and cancer in the body. This can be done with a simple step. Just a precaution, drink potion from Ti Plant regularly at least once a week. This problem can happens when its too much menstrual blood, skin injuries and so forth. But, you can heal these health problems by diligently drinking traditional herbal medicine from leaves ti plant. These benefits are related to snake bites, insects, or other toxic animals. For application is to heat the first leaf andong, crushed and then paste on the wound or skin area you want to treat. In many areas, Cordyline fruticosa leaves are also often used as natural food wrappers, because its ability to preventing bacterial growth (anti-bacterial) so that the food will remain healthy and more sterile. So thats the 11 Benefits of Ti Plant (Cordyline fruticosa) for Health and Medication. Tell us what do you think about it. Or maybe you want to ask other natural herbal medicine to overcome your healthy problem, just write at the comments column below.